Our Global Team - KRD Imports LTD.
Our global team works hard to provide your apparel brand with the quality materials, design and logistics it needs to be a success. 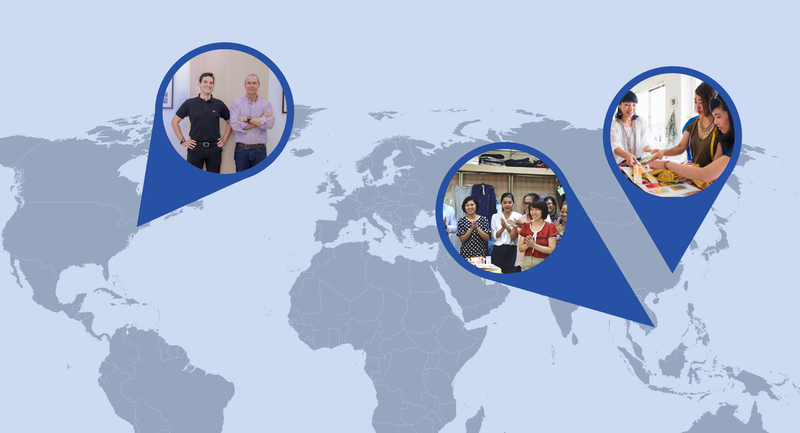 Find out more about our strategic global locations and team members below. Our New York location is our corporate headquarters. Headed by company Owner and President Lawrence Jacobs and Vice President Samuel Hallock Jacobs, our executive team includes account executives, technical designers, designers, and fabric specialists as well as our head of logistics. Our executive team travels to our retail clients throughout the US as well as to our global locations where they monitor sourcing and manufacturing to ensure the highest quality and workflow efficiencies. Our Hanoi-based team includes the finest fabric sourcing experts, designers, international logistics specialists, sample/product developers, fabric and trim bookers, factory engineers, wash-house technicians, and quality controllers. This expert team works around the clock providing the highest quality products and services that ensure your brand’s success. Our Hong Kong-based team includes our detail-oriented fabric sourcing and design team members, international logistics specialists, skilled sample/product developers, and fabric and trim bookers. Our Hong Kong team works seamlessly to provide stead-fast solutions to your apparel brand’s needs.